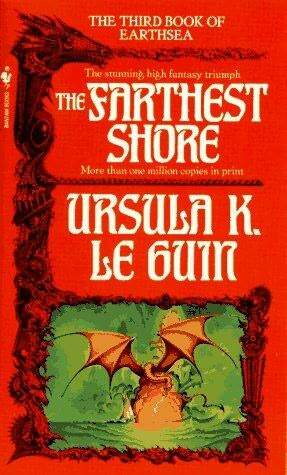 The Farthest Shore by Ursula K. Le Guin was the book I was waiting for in the Earthsea series. After the failure of Tombs of Atuan to capitalize on the tantalizing promise of A Wizard of Earthsea, I was desperate to see this book step up to the plate. Ged had to get out there and fight something big, something so large sacrifices were required, something that was threatening the fabric of the world. And Le Guin delivered. Amen. The Farthest Shore tells the story of magic fading out of Earthsea. Reports come back to Ged, now Archmage on the Island of Roke, that spells in the Outer Reaches no longer work. A young prince from Enlad comes to Roke to seek Ged’s help, and together they set off on a voyage around the world, seeking out the source of the loss. Along the way they delve into some very dark territory; magicians left maddened for their lost magic, wandering through drug-hazed darklands endlessly searching for what they lost. I took to this book from the outset. It’s very different from Tombs, even to Wizard. Where Wizard was a lot of bits, some dramatized, told throughout the adolescence of Ged, and Tombs was a side-track to the main story entirely, Farthest Shore picked up the lead story thread right from the beginning, and ran with it all the way til the end. I’d say it’s the first proper book in the series. The other two were both character studies; Dungeon Master’s handbooks, prep laid in for this book. This one tells the story of one huge conflict, from beginning to end. It reminded me strongly, in ways that were very satisfying, of The Never-Ending Story (1979). I love that movie deeply, would put it in any top 5, for its power even now to move me to tears. I cried as a child when I first saw Artax die. The moment when Bastian on the Luck Dragon sees the Ivory Tower yet standing amidst the wreckage of Fantasia still gives me shivers. The idea of an all-consuming Nothing, eating everything in its path, totally fascinates me. Farthest Shore (1972) begins with the slow realization that this particular kind of Nothing is chomping at the world. Many of the wizards on Roke don’t believe it, to them magic is un-killable. Of course Ged knows better, having fought the dark forces himself as a boy in Wizard. When Arren (very similar to the Auryn from Never Ending Story, no? Even quite close to Atreyu. ), a high-born prince from a dragon-slaying family, comes to Ged- I’m strongly reminded of the moment at the beginning of the Never Ending Story where all the weird sorts are arrayed at the top of the Ivory Tower, begging the Childlike Empress for help. Then, like Atreyu, Ged and Arren head out alone, without any help, to find the source of the magic scourge / Nothing. The rest of the book plays out in similar but different ways to the movie; everywhere they go are the signs of the death of magic, leaching color and vibrancy out of the world. Just as in the movie Atreyu finds the Southern Oracle as it crumbles, Ged and Arren find far-flung communities falling apart, their once thriving economies blasted by the loss of magic. The evidence piles up, along with a disturbing series of visions the two heroes share, of wandering dark and hopeless lands. I love this sort of thing- something dark stealing into the world, so slow and stealthy it’s unnoticed by the people affected by it. They don’t think about why there are no more crops to harvest, why the weather spells and healing charms no longer work. Instead they curse magic, coming to believe it was only ever a trick, and they were fools for ever believing in it. On their voyages Ged and Arren head into the ocean wastes of the Western Reach, where they are rescued from starvation by a flotilla city of hundreds of boats. Doubtless this is where China Mieville garnered his idea for the ‘Armada’ floating city in The Scar. They spend a while on board, learning about the culture of these people, how they survive at sea despite never making land-fall. This section was quite unconnected to the main narrative, but so brief and so interesting that I didn’t mind at all. In fact, it reminded me of the section in Life of Pi, where (surely just to pad out the books word-count) Pi lands on a blood-sucking floating ball of seaweed. After that, we accelerate into the dark-lands, and a showdown with the source of the evil that is at once satisfying, explosive, and bittersweet. Figures built up in mythology are brought into play, dragons scour the skies, and Ged rises to the battle. This is a great book. If I now view Wizard and Tombs as a build-up to this book, I can feel satisfied. Le Guin did good. As for the next in the series, Tehanu, well, I’ve got it, but am in no rush to read it. For me the arc was Ged against the dark forces. Anything that comes after that will be hard for me to care about. I’ll probably read it at some point.